Ella Thomas is the student of the month for June 2013. 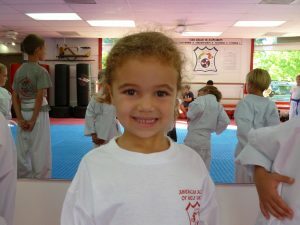 Ella started training at AASD in June of 2011 at the age of 4. Always counted on to give 100% , Ella clearly sets an example for others to emulate. Currently as a blue belt Ella is clearly on her way to become a Black Belt one day with total focus and concentration. As a little dragon Ella enjoys many of the facets of training and especially like sparring. Sifu Rick wishes to salute Ella’s parents Scott and Summer for all their support. Competition has always been a force that motivates people to try as hard as they can to give 100% effort to succeed. In martial arts class, students are exposed to two forms of competition: Self-Driven and Peer-Driven. Unlike many other activities where the main focus of competition is to defeat another person, the competition in martial arts classes emphasizes learning, which results in a positive competitive spirit among all students in the class. Self-Driven competition relies on the students’ desire to progress in rank and thus learn more advanced skills. This is a goal-oriented, motivational force that keeps students progressing. From the first day of class, students begin to develop this self-driven competitive spirit as a character trait. for success may be stifled by self-imposed limitations, rather than by competition from others. When students are self-driven, opportunities that arise in life are met with confidence and motivation. Peer-Driven competition is even more natural. Students motivate each other by advancing through the ranks as a group. Just as great sports players can inspire better efforts from their teammates, highly skilled martial arts students help others to perform to their own potential. As adults, we know the importance of working well as a group, or as a team, in performing any task. martial arts training helps develop these group skills to the fullest. The martial arts offers students unlimited opportunities for success by using the competitive spirit in positive ways. Students learn that they can be winners every day, because when you are learning, you can never lose! As a Martial Artist, you are probably looking for ways to become healthier, feel great, and improve your performance. Because our diets aren’t always perfect (some of ours more so than others), a simple vitamin/mineral supplement is probably in order. A “simple” supplement does not exceed 100% of the RDA (Recommended Daily Allowance) or AI (Adequate Intake, used when an RDA can’t be determined by the government). There are no proven benefits for consuming levels above the RDA or AI, and there may very well be health hazards associated with consuming amounts in excess of those recommended. is great, but it certainly heads you in the right direction. At the very least you’ll be confident that the supplement won’t pass through your system undissolved, giving you none of its benefits. Another trait to look for in a vitamin/mineral supplement is “national branding.” This does not mean a “name brand” advertised on television, but rather a widely distributed brand. A supermarket chain’s vitamins are very likely as good as a Centrum or One-a-Day. The idea is that a nation-wide food and drug manufacturer has their own manufacturing controls that help to assure product standards. phytochemicals, not to mention compounds yet to be identified), that you just can’t get in a pill. So train well; eat a balanced diet focused on whole grains, fruits and vegetables; and take a simple vitamin/mineral supplement just to be sure. Give yourself every opportunity and advantage to be at your best each and every day. On your road to making positive lifestyle changes, such as eating more healthfully, exercising more, and making other healthy choices, you are bound to make a few “mistakes” that require you to make corrections. The global objective is to stay on the path to an overall healthy you. An analogy of this is a plane heading on a long journey. One of the plane’s navigation systems tells it where it is in relation to where it wants to be. Over the course of a long journey, the plane could be “off course” more than 90 percent of the time and still arrive at its intended destination, within minutes of schedule. How your body feels when you eat-or think you eat-too much. How your body feels when you eat too little. How your body feels when you don’t get any or enough physical activity. How your body feels when you are getting enough physical activity. Comparison of the foods you are eating with the food guide pyramid recommendations. Internal cues of hunger and satiety. Friends or relatives giving you “constructive criticism” or expressing concern over your lifestyle choices. The goal is to have your “usual” routine include healthy food choices, plenty of physical activity, and other healthy lifestyle choices. Then, by paying attention to all forms of feedback, you can put yourself back on course when you deviate from what is truly healthy. Not only listen for feedback, but also actively seek it out. Feedback is your navigation system on your journey to a healthier you.